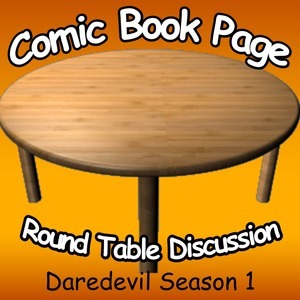 John Mayo, of ComicBookPage, and Kay Kellam, of PopArtsPlace, have a spoiler filled discussion about the first season of Netflix’s Daredevil. 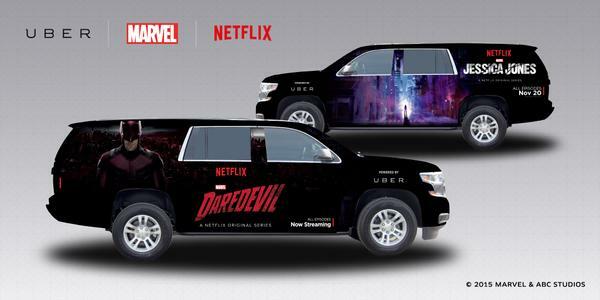 With Uber using Daredevil and Jessica Jones themed cars at New York Comic-Con this weekend, Daredevil may be on people’s minds once more. This entry was posted in Podcast, Podcasts, PopArtsPlace, Review, Television and tagged Adam Kane, Adriane Lenox, Alan Fine, Alex Shevchenko, Allie Goss, Ayelet Zurer, Ben Urich, Bill Everett, Bob Gunton, Brad Turner, Charlie Cox, Christos N. Gage, Cindy Holland, Claire Temple, Comic, Criminal Intent, Dan Buckley, Daredevil, Daryl Edwards, David Vadim, Deborah Ann Woll, Detective Hoffman, Doris Urich, Douglas Petrie, Drew Goddard, Elden Henson, Elektra Natchios, Elena Cardenas, Ellison, Elodie Yung, Euros Lyn, Farren Blackburn, Father Lantom, Fisk, Foggy Nelson, Geoffrey Cantor, Guy Ferland, Jack Murdock, James Wesley, Jeph Loeb, Jim Chory, Joe Pokaski, Joe Quesada, John Paesano, John Patrick Hayden, Josie, Judith Delgado, Karen Page, Kati Johnston, Ken Girotti, Kris Henigman, Law & Order, Law and Order, Leland Owlsley, Luke Kalteux, Madame Gao, Mahoney, Marc Jobst, Marco Ramirez, Marvel, Matt, Matt Murdock, Murdoch, Nelson McCormick, Netflix, Nick Gomez, Night Nurse, Nikolai Nikolaeff, Nobu, Peter Friedlander, Peter Hoar, Peter McRobbie, Peter Shinkoda, Phil Abraham, Rob Morgan, Rosario Dawson, Royce Johnson, Ruth Fletcher, Scott Glenn, Sergei, Sgt. Brett Mahoney, Skylar Gaertner, Stan Lee, Stephen Surjik, Steven S. DeKnight, Stick, Susan Varon, Television, Toby Leonard Moore, Turk Barrett, Vanessa, Vanessa Marianna, Vincent D'Onofrio, Vladimir Ranskahov, Vondie Curtis-Hall, Wai Ching Ho, Web, Wilson Fisk, Young Matt on October 9, 2015 by Kay.